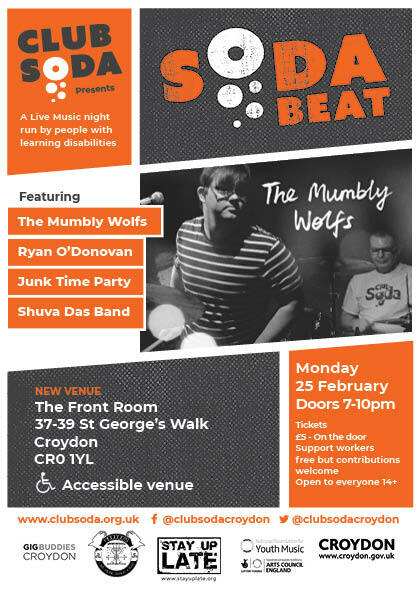 London’s only regular gig night for musicians with learning disabilities. Now at a NEW venue, The Front Room, in central Croydon. We can’t wait for this one. We welcome back legendary Argentinian musician Alan Courtis who will reunite with The Mumbly Wolfs, our loud and proud experimental music project. In support we have the enigmatic Ryan O’Donovan, lead singer of the mighty Zombie Crash and Beat Express; as well as local favourites Junk Time Party and Shuva Das Music for their first ever Soda Beat performance. Supported by our wonderful friends Hoodoo’s. We can’t wait. See you at The Front Room.